The Ötztal Bicycle Marathon is a race for road cyclists, which is held every year in late August since 1982 and is considered to be extremely difficult. Every year tens of thousands cyclists try to get one of the 4000 starting places awarded by lottery since 2008. 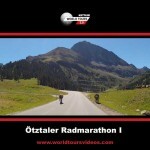 The Radmarathon has an official length of about 238 km and about 5500 meters of altitude gain. The Radmarathon starts in Sölden in the Ötztal and will take you over four passes: the Kühtai, Brenner Pass, Jaufenpass and Timmelsjoch and then back to Sölden.